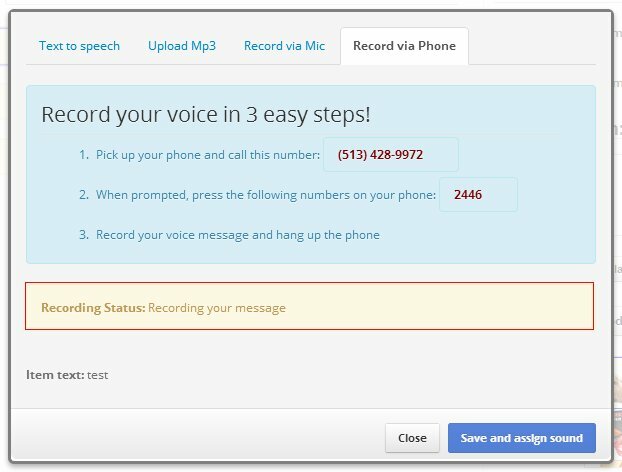 Recording your voice-over through phone is really easy. Once you select the Record via phone tab in the audio popup for your selected item, you will notice this phone number which you can dial through your phone. Please note that this is a US local number and charges will be applied accordingly. You can check the current status of the recording from this yellow box. It initially reads "Waiting for you to call the number and enter code." You can also find the Text of the selected item on the bottom of the panel so that you can repeat the same over the phone. Once you call the number on the screen, you will hear a welcome message with a prompt for entering your 4 digit code. Your four digit code is just below the phone number in instructions. Once you successfully entered your code, you can start recording your voice after the beep. You’ll also notice that the status message on the popup panel has changed to "Recording your message"
Once your recording is complete, you can hang up your phone. Your message will be available in a few seconds after processing. If you are satisfied with the voice-over you can press the "Save and assign sound" button to finalize the recording.